Late last year, Mazda announced that it would start a factory-run program to restore people’s Miatas. Mazda says that 600 applications came in, and now the first one is done. Unsurprisingly, it looks absolutely fantastic. 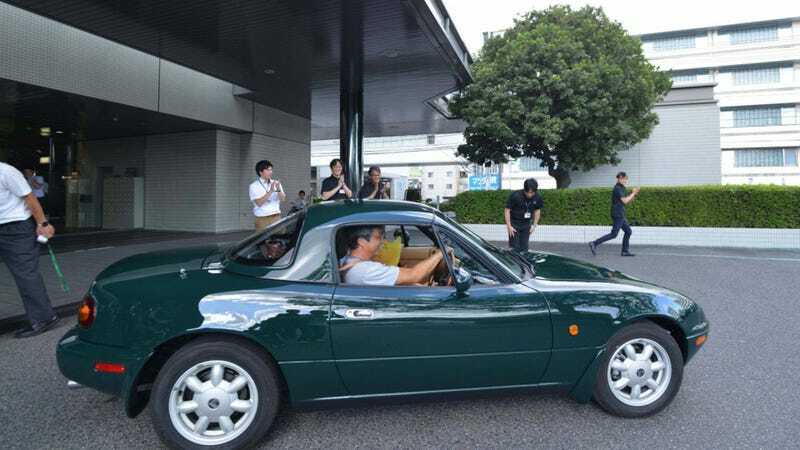 Mazda’s first accepted car is a one-owner car, bought new by Keiji Nishimoto, now a retired tomato farmer. It’s a charming car, a 1992 V Special, which came in British Racing Green with a tan interior, along with a Nardi steering wheel and shifter. Very period-appropriate. I am sure there are hordes of American Miata nerds who are longingly staring at their screens at the moment. Nardi wheel: so nice. “When asked what his plans for it were, Nishimoto replied, ‘I plan to drive it for another 25 years.’” as Japanese Nostalgic Car reports. In any case, Nishimoto had said that he was planning on restoring the thing on his own until he read about the program in the newspaper and applied. If only this program also included, well, anyone outside of Japan.